There’s a certain level of comfort with a well-done mystery. Whether it’s in traditional book form or a dramatic portrayal on-screen, a particular level of intelligence and style is present, no matter the setting. It could be Agatha Christie’s well-known Hercule Poirot or Miss Marple, or the OCD adventures of Adrian Monk on television, but there are always familiar trappings for the reader/viewer to enjoy and have as touchstones. The same could definitely be said about the A&E Network’s 2001-2002 adaptation of A Nero Wolfe Mystery, dramatizing the literary creations of author Rex Stout. 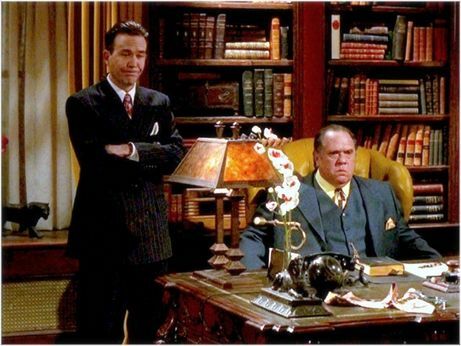 For any unaware of the long-standing characters, Nero Wolfe (Maury Chaykin) was a rather famous and rich recluse who solved mysteries without leaving his own house! 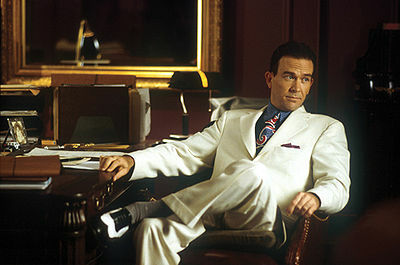 His right-hand man, Archie Goodwin (Timothy Hutton), did the majority of Wolfe’s investigative work, discovering and reporting information to his boss (who then put all the pieces together to solve the crime). Nero demands. Fritz provides even better. Other regular characters included the long-suffering, but loyal, butler/cook Fritz Brenner (Colin Fox), who dealt with Wolfe’s demanding peculiarities. These included very specific instructions on culinary preferences, down-to-the-minute details on when dinner was served, when to make sure there were no interruptions, and how to intercept and deter almost all visitors to Wolfe’s brownstone. Fritz knew how to handle Wolfe’s persnickety nature, but was very protective of his boss as well. One of the few visitors who was barely (and I do mean barely) tolerated was Police Inspector Cramer (Bill Smitrovitch), whose presence was only allowed because of his official status and the information it gave Wolfe to advance his investigations. Operating as a 1950’s period piece, A Nero Wolfe Mystery takes place in New York City, complete with some shady gangsters, femmes fatales, mostly innocent ingénues, and times when actions (and fists) speak louder than words. 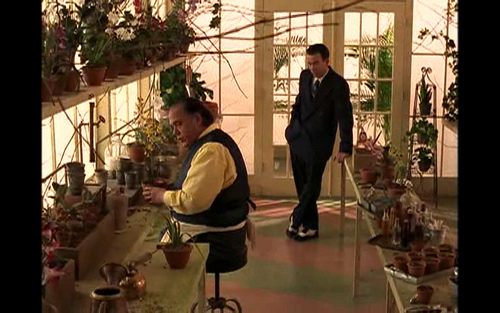 The “uncivilized” world outside the doors of Wolfe’s townhouse is seldom, if ever, allowed to intrude upon the order and intellect living there, most especially when Wolfe is in his rooftop greenhouse tending (some would say “fussing”) over his beloved orchid collection. We therefore see the world (and the crimes) through the eyes of investigator Archie, whose playful attitude, eye for the ladies, and ability to get tough when circumstances demand, allow viewers all the fun of a well-played mystery. The device of not having the true mastermind on-site provides for dialogue between Archie and the imposing Wolfe, exposing to the audience the information that would normally be an internal thought process for a TV detective. This, in the best mystery tradition, lets the audience play along with the investigation. 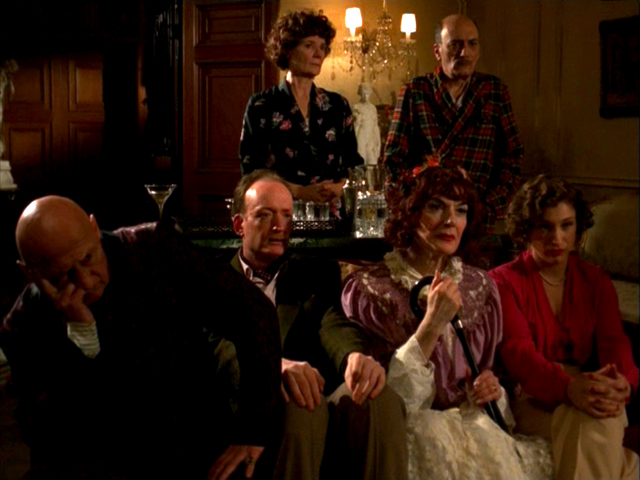 The concept also allows for the traditional “gather everyone into a room” ending of many great mysteries, often the room being the lavish office of Nero Wolfe’s brownstone, where the dénouement of most cases was revealed. One of you.... is the murderer! There’s an entire sub-genre of mysteries in the book world currently known as “cozy” mysteries. The name comes from the style of description, where grisly descriptions of dead bodies are frowned upon, and style and cleverness are celebrated more than the realistic messiness of homicide; in other words, a “cozy” murder. In this respect, A Nero Wolfe Mystery fits perfectly, as the crime victims are seldom, if ever, seen as anything other than a dead body on the floor (as if they were sleeping). The fun of both “cozy” mysteries and Nero Wolfe is in comfortably playing along, trying to figure out “whodunit”, and enjoying the mood and presentation along the way. In 2001, A&E produced what they believed to be a one-off movie adapting Rex Stout’s The Golden Spiders, featuring Hutton and Chaykin. Hutton enjoyed his experience tremendously, introducing the world of Archie and Nero to an entirely new audience. When executives at A&E floated the idea of a continuing series (due to the good reviews and ratings the movie had received), Hutton enthusiastically asked not only to continue his role, but to become both a producer and director on the series in addition to a lead actor. A&E was more than happy to accommodate an Academy Award winner. Hutton not only brought out more of this period style and flair in his presentation, but he also worked with a number of actors who became familiar with the specific type and genre he was trying to present. Therefore, if only for a level of comfort for both the production and the audience, many of these actors formed a sort of repertory company, and were featured in multiple episodes as widely different characters. Kari Matchett played Lily Rowan, Archie’s on-again, off-again, love interest in a number of stories. But she also played almost another dozen characters in different episodes, from nightclub singer to European immigrant. Occasionally a suspect, occasionally an ingénue, she and Hutton developed a certain special chemistry in their performances. That relationship continues to this day, as she was requested by Hutton to play his ex-wife, recurring character Maggie, on Hutton’s current show Leverage. 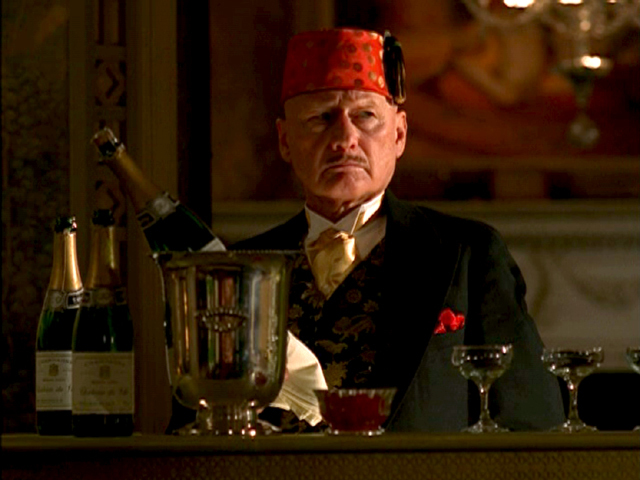 James Tolkan is another of these recurring actors on A Nero Wolfe Mystery, playing everything from a tough FBI agent to a rather rich, entitled drunk. While Tolkan has been traditionally cast as a rather rigid authority figure, there are still many shades to that type of character, and Tolkan was able to portray many of them during his stint on the series. While his rather distinctive looks (and bald head) made him easy to spot, his superb acting ability allowed him to inhabit various personalities and allowed the viewing audience to enjoy whatever flavor he presented each story. All in all, 15 different actors (besides the regular cast) appeared in at least half the series episodes, in multiple roles. And over 60 actors portrayed at least 2 different parts in the series (which is incredible, considering there were only 30 hours filmed in total). 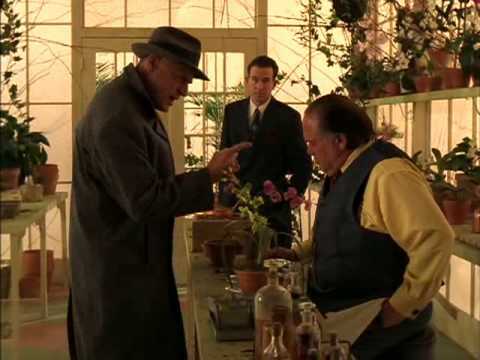 A Nero Wolfe Mystery truly did have its own little world, full of actors who trusted each other and allowed consistent performances from all due to their level of comfort. That comfort translated to the audience as well, bringing into our homes the familiarity of old friends and new adventures, no matter who they portrayed each week. If anyone at home was already familiar with Nero and Archie, the stories were like the gourmand Wolfe’s rather famous meals: just one more helping of exquisite comfort food. All 30 hours were taken from the original stories of Rex Stout, lovingly adapted for television in a very faithful manner. Many of the stories were made into 2-part episodes, allowing time for proper dissemination of the layered plots from the original novels. Anyone wishing to immerse themselves into a world gone by, full of action, fun, and mystery, had to look no further than A Nero Wolfe Mystery. The immersion also involved some unique challenges. Street and location shooting meant using period automobiles and the removal of what would be anachronistic items like air conditioners and other modern amenities. Costumes and make-up required specialized application in order to re-create the feel of fashionable ’50’s looks. Since Hutton was a producer and director in addition to his starring role, he had to make decisions for the look and presentation for the series almost every minute of every day, let alone involve himself in the 12-to-15 hour shooting days as an actor. And yet, for him, this was also a level of comfort. This went all the way down to the dialogue of the show, a throwback to movies made half a century before the filming of the series. Taken together, the elements of A Nero Wolfe Mystery created something about as comfortable and classy as a television show could be. It involved a familiar cast each week, memorable period presentation, fun characters, and the opportunity for viewers to lose themselves in a clever story, full of twist and turns in great mystery tradition. What else would you expect from a cozy mystery repertory company? TIMOTHY HUTTON (Archie Goodwin) won an Oscar for his performance in the movie Ordinary People. He has preferred character roles in many independent films, taking parts on the basis of their acting needs rather than their box-office potential. 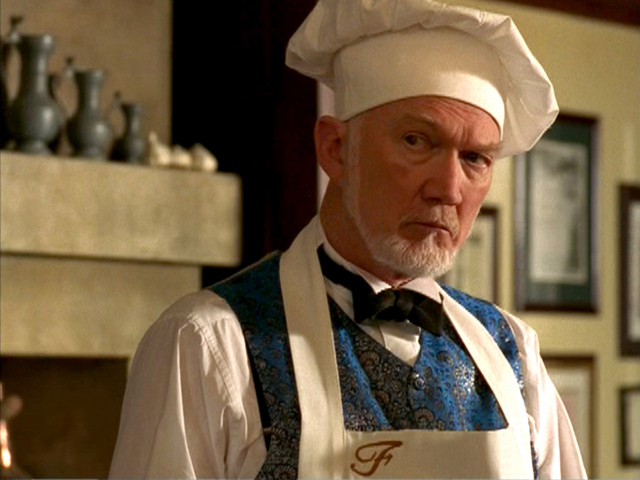 In addition to his wearing multiple hats (acting, producing, directing) on A Nero Wolfe Mystery, he’s the lead on TNT’s Leverage, where he literally gets to wear multiple hats in various cons and heists (a part he took simply because “he wanted to have fun!”) Also noted is the family acting legacy, as Hutton’s father Jim played the great American sleuth Ellery Queen in the ’70’s series of the same name, a role Tim paid tribute to in a recent episode of Leverage. 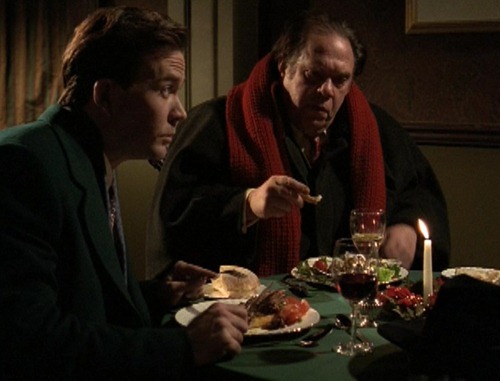 MAURY CHAYKIN (Nero Wolfe) is a relatively soft-spoken actor, quite unlike the bombastic Nero Wolfe. A prolific actor in Canada, he’s best remembered in America (other than his role as Wolfe) as being the commanding officer of Kevin Costner’s character in Dances With Wolves. He died of kidney failure on his 61st birthday in 2010. COLIN FOX (Fritz Brenner) is another Canadian actor, having starred in PSI: Chronicles of the Paranormal and guested in numerous series shot north of the border, both for American and Canadian television. He’s also a stage veteran, and helped design and perform a unique theatre work for pianos, actors, and multimedia. BILL SMITROVITCH (Inspector Cramer) played the patriarch on the early ’90’s series Life Goes On, a four-year success for ABC. He’s also starred in Crime Story, The Practice, Without a Trace, and The Event. Specializing in tough-guy/military roles, he’s been featured on television shows from Star Trek: Deep Space Nine to Castle, and movies like Independence Day, Air Force One, and Iron Man. KARI MATCHETT (Lily Rowan and others) is a favorite on this site, and although she’s not yet been a regular on a show covered here, she’s been a featured and recurring character in Wonderfalls, Invasion, and Studio 60 on the Sunset Strip. Currently, she’s a regular on the USA series Covert Affairs, and hopefully will make a return visit to Leverage in the near future. JAMES TOLKAN (FBI Agent Wragg and others) was a notable presence in the Back to the Future trilogy, playing Michael J. Fox’s school principal (and other roles, naturally, in the past and future settings of the sequels). A regular on the short-lived comedy Mary, he was also a recurring foil for Remington Steele, as an insurance investigator out to prove Steele’s guilt. Other significant roles were in the feature films Top Gun and WarGames. In addition to his multiple acting parts on A Nero Wolfe Mystery, he also directed two episodes of the series. For those sleuths wishing more information on Nero Wolfe, in book form or on television, there are multiple resources available. The series was released on DVD, and is still available, as are most of the books written by Rex Stout. The fan website A Nero Wolfe Mystery is an excellent source of information, including links to scripts and notes about scenes filmed but never aired on A&E. Other adaptations of Nero Wolfe have been tried, most notably a 14 episode NBC series from 1981 starring Lee Horsley as Archie and William Conrad as Nero Wolfe (memtioned here only for completeness — it wasn’t really all that good). Oddly enough, both shows used the same Rex Stout story, The Golden Spiders, as their pilot episodes. A&E Network was in the midst of changing from running off-network reruns to original programming in the early parts of the decade, and despite the enthusiasm most had for the project, costs and a limited pocketbook caused the demise of the show after two short seasons and a total of 30 hours, counting the pseudo-pilot film of a year earlier. While the network was still searching for the right combination of money, time, and program content, A Nero Wolfe Mystery certainly was one element they could point to as successful. Fondly remembered by those who saw it originally, its style, intelligence, and cleverness are definitely missed on today’s television screens. The idea of a repertory cast for a television drama was last used regularly on the live dramatic broadcasts of the 1950’s, so the use of such a group for this show was a unique idea almost 50 years later. A Nero Wolfe Mystery did it, and did it well, embracing the entire concept with flair, confidence, and comfort seldom found in most modern shows. There’s more than a little to be said for something that can best be described as “cozy’. A Nero Wolfe Mystery couldn’t be described as well any other way. Aired at Friday 8/7 Central? No. Although cable networks tend to repeat their shows more than broadcast networks, each episode premiered on Sundays at 8/7 Central.